This is the new home of UAA discussion. Welcome aboard, everyone. More on the new stadium. panoramic pix. The Plain Dealer reports 70 Spartans in camp. No official word yet on return of any of the '04 non-participants. Great job all on the Kickoff. The UAA page and team page for CMU have different forecasts. I'm pleased with the confidence shown in CWRU by the reporter and by Pat and Keith. Your ranking is fair to somewhat optimistic. Pat and Keith I think you have overestimated CMU. 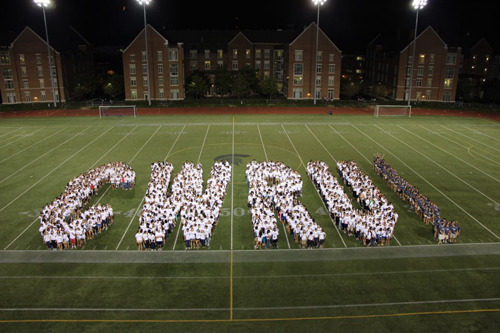 CWRU won last year and no other team held them to fewer points. No quarrell with ranking them higher, but not by 25 spots. The reporter predicts Case wins. And the reporter uses the dreaded "Case Western", please either CWRU or Case. Harvey #1 in nation in pass eff, before injury? Highest I see is #27 - 149.7 after week 3 (Kenyon). He did have a good game against Wooster, and ended with a rating in the 130s. He was 1 of 5 with 4 sacks in the one half he played in the opener, but the one comp was a TD. OK, 9 different FR started one or both of the last 2 games, but 4 of them aren't with the team this year (both QBs and OL and DL starters). I count 7 SR s who either started last year or are forecast to challenge this year, so seems more than 4 will see significant action. No Cellura (top WR), Minter or Harris (all UAA) back from 03. Still the Kickoff is an amazing accomplishment!! Thanks. We felt the writer overestimated the entire UAA (had everyone 7-3 or better) and we went through and re-analyzed the records for the conference capsule. I guess we failed to pass that update along to the affected schools. I also wouldn't lose sleep over the difference between being #99 and #124. There's very little separating teams at that point. I don't disagree with those points. The ratings were clearly too high for the next to last rated conference. Don't worry so much about who's missing at Case. Look what you have-- a transfer QB from Valpo who will see serious time, a transfer DL from powerful D2 Michigan Tech, a 6'5" 280# pound freshman with good feet, and a slew of kids coming back with experience. You know I think a lot of that staff, too. I think Case is in a nice position this fall. The opener at Oberlin is a must-win game. Then, the momentum of kicking off the new facility should carry them through week two. I would admit to having a twisted sense of humor but when I saw "The opener at Oberlin is a must-win game"
I fell on the floor in laughter. I never, never, thought I'd see Oberlin and must win in the same sentence. And the roster now lists Minter back to add experience at WR. Started for CWRU in 03 and was Navy's #4 receiver in 01, DNP in 02 or 04...now if he can just get Cellura, his HS teammate, back. I agree the newcomers look great on paper. Esp. the OL FR - 6'4 285. 6'5 275, 6'3 280, and 6'2 290! And #s are up from last year's 54 to 67. I wasn't lamented the losses, as much as reporting them. Things are moving in the right direction!! Come on now ! People said that when Oberlin pulled a fast one and did well a couple of seasons ago. It's not impossible and some other people will be laughing if Oberlin were to pull an upset in that season opener (although probably less likely this year). Hope things have been going well. Where did the summer go? Looking forward our opener at JCU on Sept. 10th. A possibility that I might be there (working of course! ), but not sure as yet. How about you - are you thinking of going? Not quite sure how to assess our team just yet, but will have a better idea after this upcoming weekend's final annual intra-squad game. I couldn't find UAA in the index for ATR, but I see it's being covered in GL again. Still the non-return of so many players with lots of p/t two years in a row, is an issue that warrants a look. The other 3 UAA teams returned all their non-senior all UAA players. The Great Lakes UAA teams are being covered in the Great Lakes again. The Midwest UAA teams are being covered in the Midwest again.